Hello there and welcome back to our challenge blog. Thank you so much for stopping by again. Make sure to join the challenges in order to get in the drawing for the 30.00 Gift Certificate winnings. We always give away 2 of them. Let us see some cardboard in your creations this week. Below you'll find some designteam inspiration for this challenge. It is a new month so it's also time to introduce our February guest designer. We are very happy to have Kim Schofield as our guestdesigner this month! 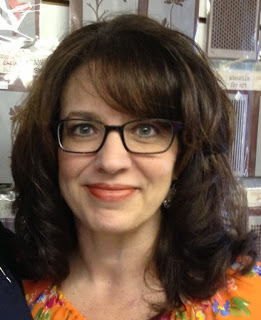 My name is Kim Schofield and I have been a crafter and instructor for close to 20 years. I live with my husband and two children in New Hampshire where, in my free time, I enjoy art journaling and card making. My work has been published in various print and online magazines, and I’ve worked on a number of design teams. I am Copic certified and have taught a wide range of classes in a number of local scrapbook, stamp, and craft stores. Now we have two winners of the 30.00 gift certificates to our online store. These winners come from our entries to last month's challenge. Congrats to you both please email Claudine fro your prize.